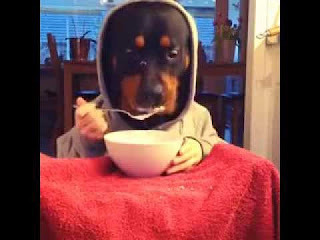 Funny Rottweiler eating with human hands! In this simulation of Rottie eating with human hand, the dog is impressively trained to eat until fed by the owners’ hands. This video was shot in one take, no cuts or editing - and this Rottweiler had a wonderful time..
Maybe this is the funniest Rottweiler video you will ever see. Dog eating with human hands has become a phenomenon in Youtube..